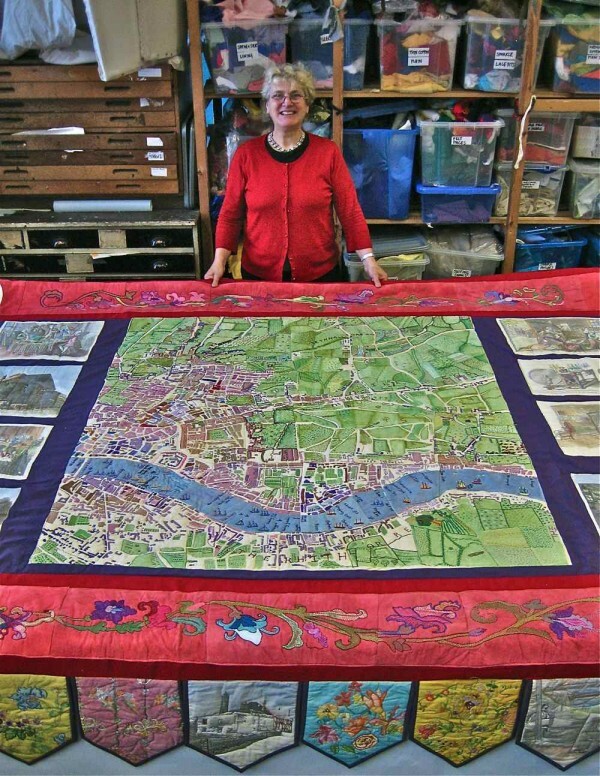 This is Di England of Stitches in Time with a tapestry based on the Roque Map of East London, 1746 – just one of hundreds of elaborate textile pieces, created collaboratively and involving over three thousand people, that she has supervised in recent years. As a consequence, the former Assembly Room of Limehouse Town Hall – in the shadow of Nicholas Hawksmoor’s St Anne’s, Limehouse – has been turned into a kind of giant sewing box where a million reels of thread and scraps of fabric are neatly organised in containers. 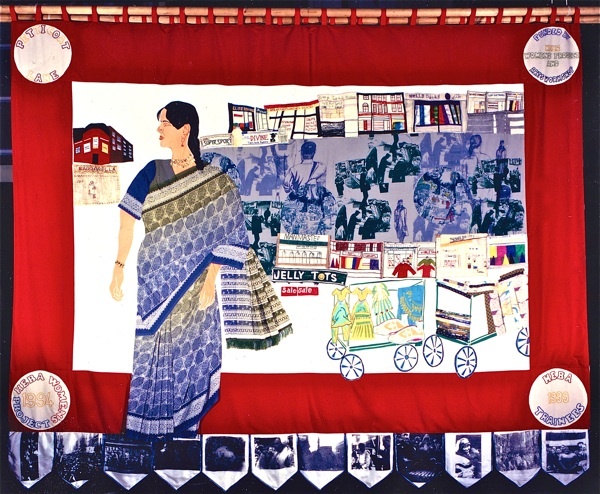 There you can find everything you could need for the embroidery, appliqué, batik, printing, painting and weaving that is involved in the creation of these textile masterpieces which tell the story of the East End through stitching. In these works, intricate details reveal the contribution of individuals while the overall conceptions are a devised collectively, requiring critical decisions about the nature of the social pictures that result. 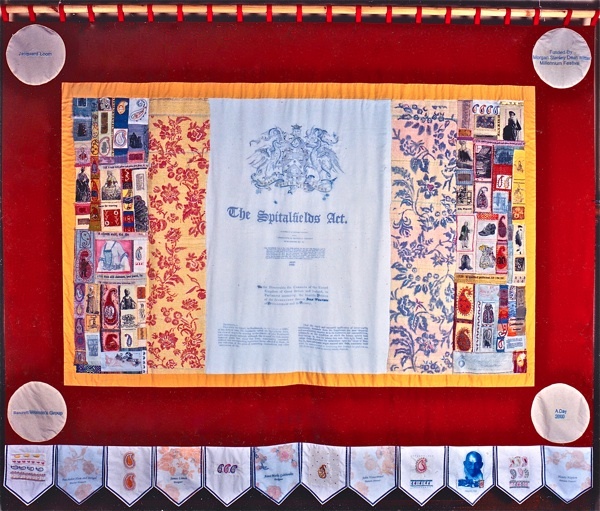 Inspired by the trade union banners that were once housed here when the building was a museum of Labour history, Stitches in Time has been involved with all kinds of groups across the East End to create pictorial histories of communities, devised as endeavours that serve to bring people together in the practise of making. 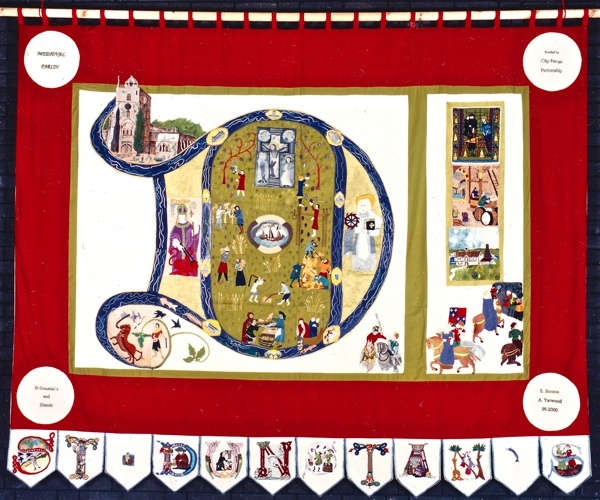 Existing today as a social enterprise run along co-operative lines, Stitches in Time runs outreach groups alongside the business of tapestry-making. Especially important is “English for Sewing,” providing a social focus for isolated women who do not speak English, in fulfilment of the remit of Stitches in Time to bring cultures closer by getting people from different backgrounds sewing side by side. In effect, using sewing as a means of developing social cohesion, literally stitching communities together. In a rare moment of repose, I was able to sit down with Di in a quiet corner of the Assembly Room – surrounded by piles of textiles and sewing paraphernalia – while she spoke to me of her own background and how it all started. “I was an ordinary girl from St Albans. I had signed up for Social Anthropology because I was interested in people and instead I discovered it was all about statistics. But when I went to St Albans Arts College, I rang up my mother and said, “I found the right thing, first time.” Yet although I wanted to be an artist, I couldn’t think of a way to relate it to everyday life. We were from Yorkshire originally, but my father died when I was very young and my mother came South to earn a living. She was a primary school teacher, an educationalist with a passionate belief in the expressive arts. I trained in painting & sculpture at the Bristol & West of England Academy and at Chelsea College of Art. At Chelsea, the textiles department was next door and I responded to that. My grandmother was a seamstress and two of my aunts were dressmakers who rode motor bikes in the nineteen thirties. Even as a child, I would collect leaves to make dyes and I gathered boxes of textiles. I worked as a teacher at Newham in the early seventies before I joined Freeform Arts, a community arts organisation in Dalston and I found it refreshing because it was all to do with making, putting art where it wasn’t removed from everyday life. The question we asked ourselves was how could you create things that had relevance for people in their daily lives. At first, the Arts Council said, “We will fund the roses but not the dandelions.” though gradually they accepted the idea that art could be created where people lived, in the workplace and in schools, and they started a community arts panel. 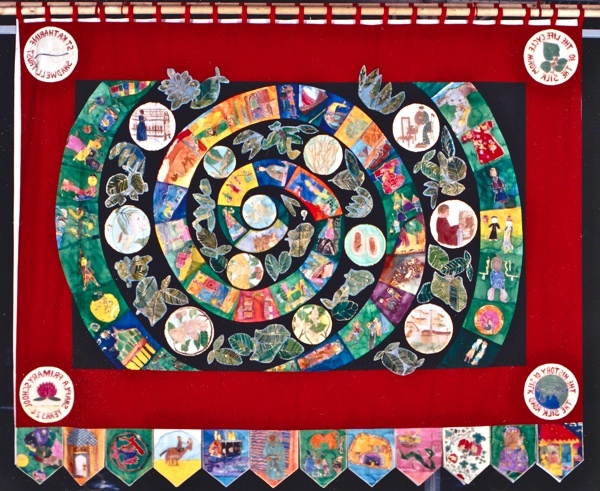 At that time, I was setting up a print workshop in the Spitalfields Market and we made tapestries there that were a cultural history of the East End told by its people. We hung them up in the market and discovered there was huge demand for tapestries as community projects. By 1999, we received funding to create this organisation, Stitches in Time, with a special emphasis on local history. We moved into Limehouse Town Hall in 2001 and the next year we became a registered charity. 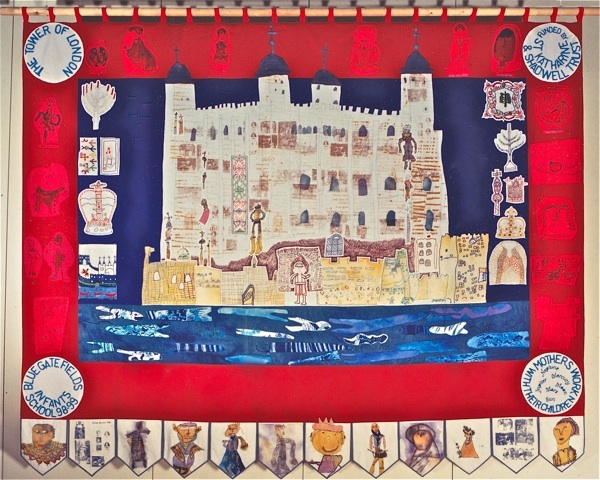 The Tower of London by Bluegate Fields Infants School & Mothers’ Group. St Dunstan’s by Members of St Dunstan’s Parish, Stepney. Life Cycle of the Silk Worm by Shapla Primary School & Mothers’ Group. The Jacquard Loom by Bancroft Women’s Group. Jewish Wedding by Kobi Nazrul Centre. 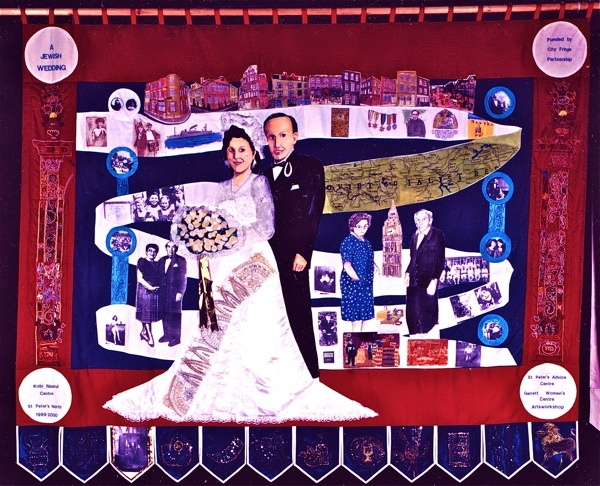 Petticoat Lane by Heba Women’s Project. I’m amazed by the quality of your postings … my favourite blog for a long time now. Felt a real sense of joy reading this. Really delighted to see that Limehouse Town Hall is full of textiles again. When I was around about 20, when the museum was in residence, I spent a lot of time in that hall with those trade union banners. In those days it was the fiefdom of Terry McCarthy, who some readers of this blog will no doubt remember. I was at the Grayson Perry exhibition at the British Museum yesterday which, once again, showed the value of textile art and craft. I will be keeping a look out for ‘Stitches In Time’ exhibitions. My favourite blog too! And these quilts are just stunning. Looks like an exhibition is overdue!! This map is a wonderful piece of work, truly inspirational! The project deserves all the support it can get. Marvellous. Life cycle is in backwards! These are smply beautiful works of art that have their roots in communities both past and present. I love them and what Stitches in Time are doing. I love it. I have been co-ordinating a much smaller project here in Auckland using art and stitch as the vehicle as a means of combating social isolation amongst the many migrants and local people we have in our community. It really works! Women of all ages, ethnicities and backgrounds sitting around a table chatting and stitching. There is an exhibition tonight in Mile End Park, E3 4QY to celebrate the life and works of Di.